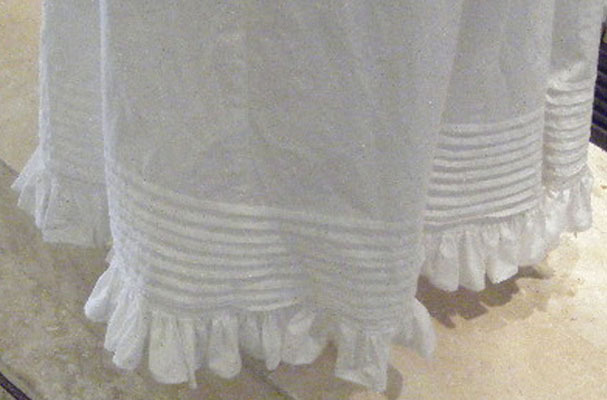 This regency bodiced petticoat was rare in period but can support a smaller bust or when a corset is not wanted. This can be a more comfortable alternative because the tightest fit is right at the underbust waistline and then raises the bust from that point. This garment combines the lift of a soft short corset and the necessary petticoat into one garment. This project was the first support garment I made for my Mom, who wears this for English Country, Scottish Country, and Contra Dance events. It is better than any sports bra for active wear! The second one was made for another lady who wanted no part of a corset!